During March 2004 I received several scans from Hubert Prigl who had done a research on Tuln AB in Austria. "All pictures are from former American soldiers on the Tulln airbase and all have given me these pictures. It is known as Tulln airbase but (it is in fact closer to a place called Langenlebarn and the actual name of the airbase was Brumowski airbase, named after WW I fighter pilot Godwin Brumowsky). The airbase was the main airbase for the American troops in Vienna from 1945 to 1955. From 1946 to 1955 the PAN AM worked on the airbase and when the Schwechat airbase was closed all other airlines flew to Langenlebarn. 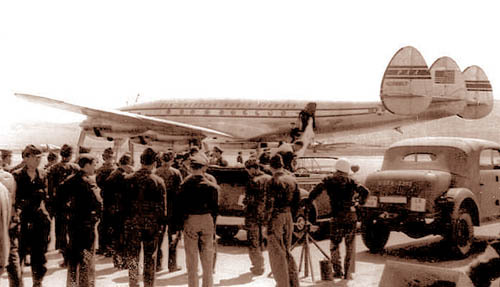 In summer 1952 Langenlebarn was the only airport for Vienna for 6 weeks.". 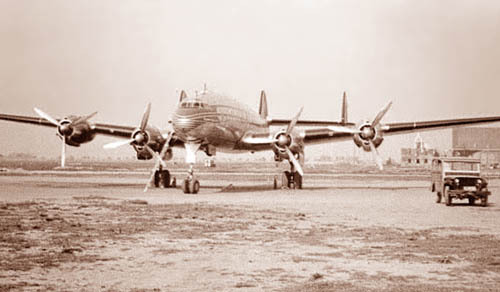 NC88857 Clipper Unity first landed in Langenlebarn on 01May1946. 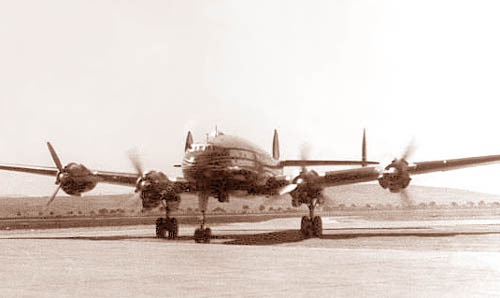 NC88860 Clipper Courier visited on 16Jun1946. And NC88837 Clipper Challenger first landed on 09Sep1946. 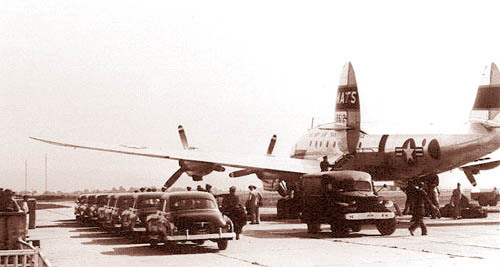 Arrival of the first Pan American World Airways flight at Tulln AB, in 1946. One can see that this Constellation has round windows. 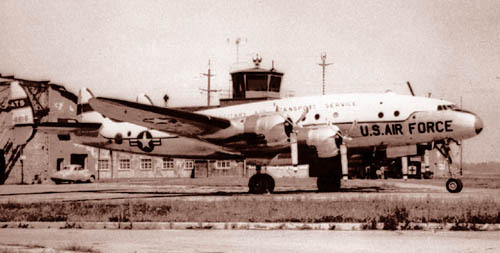 The Pan American service did not survive for very long, being replaced by a DC3 and later the DC4. 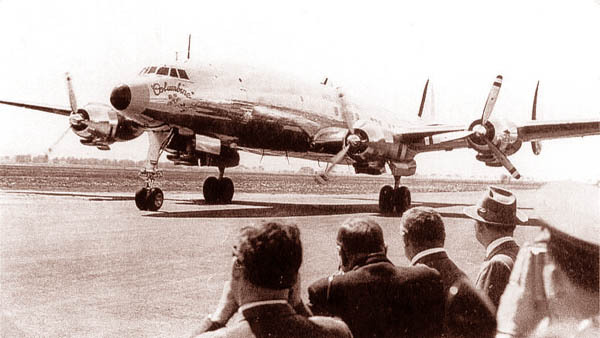 In 1946 the Constellation flight was inaugurated. 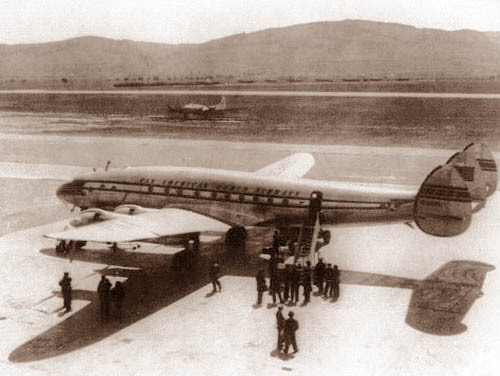 The service was evidently none too successful since within a year the Constellation had been cut back to New York - London; Vienna became being served by a DC-3 connection, which left London at 14.00 and after calling at Brussels, Frankfurt and Prague, reached Vienna at 22.20. 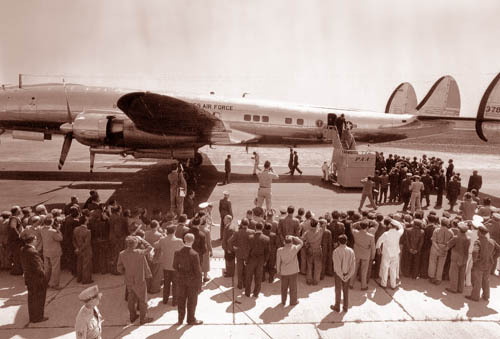 The DC-3 returned to London the following day, leaving Vienna at 10.00 and arriving at London at 16.05. Since a daily service was maintained two DC-3s were required for the service. (Credit: Bill Becket). A Lockheed Constellation of Pan American is seen parked at Tulln AB, awaiting preparations for another flight ovet the Atlantic. This photo was taken in dedication of the first visit of a C-69 at Tulln AB. The arrival of a delegation at Tulln AB. The titles MATS on the tail are short for Military Air Transport Service. While the caption with the photo read "13May55: arrival of US President Dulles by C-69 "Columbine" at Tulln Air Base. ", this seems incorrect as the USA never had a President Dulles; John Foster Dulles was Secretary of State and Allen Dulles was head of the CIA at that time. A true "Connie" expert also corrected me on the type of aircraft: "the photo is not of a C-69 but Columbine III, VC-121E 53-7885. " This turned into quite a history lesson, but it is important to get the facts right ! Thanks all ! He was a World War I veteran and he was appointed in the United States Senate from New York, serving out the term of Robert F. Wagner, who had retired due to ill-health. He was defeated for re-election. He subsequently served as Secretary of State in the administration of President Dwight D. Eisenhower, where he was instrumental in forming the Southeast Treaty Organization (SEATO). He resigned his office on April 15, 1959 as a result of a bout with cancer. He died on May 24, 1959." Clearly Pan American had its operation in place and provided the ground equipment. A VIP treatment was in place and no doubt "Columbine III" made as much an impression with her sleek lines as the arrival of the US President. 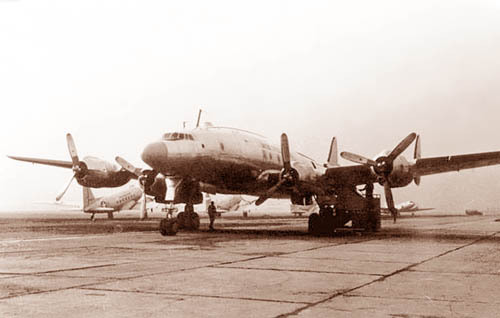 The rectangular windows can clearly be seen, identifying it as a Super Constellation whereas round windows were on the C-69 Constellation. Nanne Dijkstra asked: "Had this visit something to do with the last year the Russians were in Austria?." Well, he himself provided the answer after researching the internet: The photo with Foster Dulles was taken on May 14th 1955. That day the Ministers of State of the Allied Forces (McMillan - UK, Dulles -USA, Molotov - USSR and Pinay - France) came to Vienna to sign a treaty, which made Austria a souvereign state again. Another picture of a C-69 "MATS"-transport. This photo of 48-616 was taken in 1954. In the background the control tower can be seen. "I was stationed at Tulln AB from February 1949 to early 1950. I was 19 years old then and a Corporal in the newly formed Air Force. (It was called the Army Air Corps up to 1947) I was just new out of technical school at Scott AFB in Illinois where I was trained to be a Control Tower Operator. I was assigned to the Control Tower at Tulln for the above stated period and then I was transferred to detached duty at the airfield in Salzburg, Austria again as a Control Tower Operator. One thing confuses me about your website: you state that Pan American Airlines used Tulln, flying Lockheed Constellation type aircraft in and out of Tulln. In all the time I was stationed at Tulln and working the Control Tower I have NEVER seen nor heard of a PAA flight or ANY Constellation using that Air Base! In fact, I have never even seen a non-military aircraft land or take off there. The largest aircraft I can remember seeing in the year that I worked there was a C-54/DC-4. Most of the time it was just C47's and DC3's. I've never heard anything about PAA using the base between 1946 and the time I left there in 1950. But, I know for certain that no aircraft of the Constellations size OR any civilian aircraft for that matter ever got close to Tulln (while I was there). I've never seen any civilian airliners, only military aircraft land at Tulln. The Russians would have a fit if an American civilian airliner were to land in their zone unless it was an emergency, especially at Tulln, Langenlebarn. I don't know WHEN civilian airlines were allowed into Tulln AFB, but definately not during my tenure there (most of 1949). " "I can't speak for Ed since I left there a few days after a PAA Connie first landed at Tulln. Two PAA representatives visited me in the control tower that same day. They were interested in making IFR approaches to Tulln AB and were interested in local air traffic control procedures. I left the base on 6 May 1946. There may be a PAA schedule regarding the length of time PAA used Tulln AB. The Russians never complained, to my knowledge, about PAA flights into Tulln. The only restrictions that I can recall were that no armed aircraft could land the at base and the flights must stay within flight boundaries established by the Americans and Russians. Since PAA flights were not all that successful in serving Vienna, the flights could have stopped by the time that Ed arrived there." A better view of what have must have been a giant plane in those days, on the ramp of Tulln AB. It was taken from the control tower by Jack Edmonds. 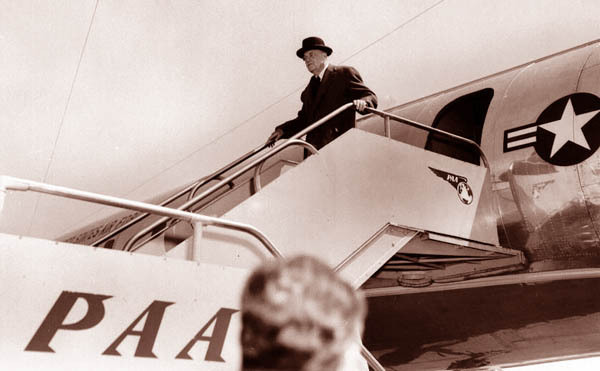 Hubert Prigl wrote in Feb.2006: "Pan Am flights were from June 1946 to June 1955. I have a newspaper article "Der große Umzug", the story of the last days from PAN AM in Langenlebarn and the new station in Schwechat. " Just viewed this terrific web site about Tulln and the Pan Am flights. Yes, Pan Am did in fact fly into Tulln. I was a fire fighter at Tulln from 1949-1952. Our big excitement for the day was the arrival of Pan Am. This meant standing by at the flight line station and watching the plane land...! Good job on the photos from Hubert Prigl. I know him quite well, even visited him in Vienna during my 2001 trip. Thanks for the memories. I would like to thank Hubert Prigl for making these photos available for my website; I have edited the scans in terms of cropping and some sepia toning. Various people contributed to the comments: Scott Reynolds, Joel Harris, Ralph "Connieman" Pettersen, Marshall Massengale, Jim Davis, Bill Becket and Nanne Dijkstra.